Mona Meshram opened in India Women’s first Super Six game of the Women’s World Cup Qualifier 2017 against South Africa Women on Wednesday (February 15) because MD Thirushkamini, who made an unbeaten century in her last innings, was unwell. Meshram overcame a sluggish start to make 55 and put on a second-wicket stand of 96 with Mithali Raj (64), as India prevailed by 49 runs at the P Sara Oval and almost booked itself a place at the World Cup in England in June. An equally important contribution to the India innings came from the sixth-wicket partnership of 29, between Devika Vaidya and Shikha Pandey. The duo hit four boundaries in the space of five balls to help India reach 205 for 8, when at one time, such a score looked out of reach. Despite Trisha Chetty’s 52, South Africa could manage only 156 in 46.4 overs. Like Meshram and Raj, who took the lead in pushing the run rate after India struggled to 26 for 1 in 11.2 overs, the spinners once again asserted their dominance to keep India’s unbeaten streak in the tournament intact. Having recognised during the warm-up loss that South African love pace off the surface, India went into the game with four spinners and one seamer. It paid off as the quartet of Ekta Bisht, Deepti Sharma, Poonam Yadav and Rajeshwari Gayakwad, playing together for the first time, choked South Africa to finish with combined figures of 37-4-120-6. Pandey chipped in with a career-best 4 for 34. With rain predicted in the afternoon and keen to make use of any early moisture as a result of the previous evening’s shower, South Africa opted to field first. The decision looked the right one, as the pace trio of Shabnim Ismail, Marizanne Kapp and Ayabonga Khaka bowled dry, denying the openers freedom to play their strokes. With the innings needing some real impetus, Raj promoted herself to No. 3. Suddenly, the complexion changed. Even if Meshram was struggling to find the gaps and accounting for a large number of dot balls, Raj had no problem in negotiating what was on offer. Her nimble footwork kept the scoreboard busy, before Meshram used her strong bottom hand to break the shackles. 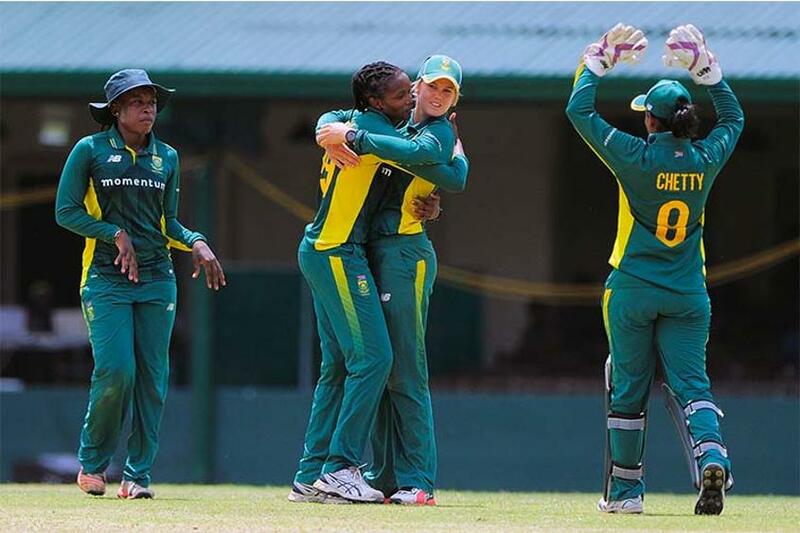 Meshram first showcased her intent in the 22nd over, when she stepped out to Yolani Fourie, the offspinner, and struck a big six over midwicket. Having made just 14 runs in the first ten overs, India put on 98 runs in the next 20 as the innings got some much-needed momentum. But as is so often the case, a set batter got out trying to up the ante, and it triggered a collapse. Meshram stepped out to hit Dane van Niekerk, the legspinner, against the turn and was bowled. It was the moment of the innings, as van Niekerk, the captain, became the first South Africa bowler to pick up 100 ODI wickets. Harmanpreet Kaur then fell in the first over of the batting Power Play when she played on to a sharp incoming delivery from Kapp. Raj hit Ismail for two straight fours in the 37th over, but was soon caught at point as India made only 17 for 2 in that block of five overs. When Veda Krishnamurthy fell against the run of play for 18, India was reduced to 164 for 5 in 43.1 overs, and in need of some inspiration. Van Niekerk possibly made a mistake at that point when she over-attacked with eight fielders inside the 30-yard circle. By the time she corrected the field, India had extracted the most out of its lower order. Bisht and Pandey struck early to reduce South Africa to 8 for 2 in 4.2 overs in their chase. It fell upon the experienced pair of Mignon du Preez and Chetty to take the team ahead, but it was never going to be easy against a well-oiled unit. Even as it added 33 runs, and Chetty then put on 52 runs for the fourth wicket with Kapp, South Africa always needed a blistering performance from somewhere to pull off a coup. What made its task even more difficult was India’s quality fielding inside the 30-yard circle. The fielders anticipated well and moved in the direction of the ball to increase the dot-ball percentage over by over. They also took eight catches, including those of Ismail in the 44th over and Khaka in the 47th, to give Bisht and Pandey their third and fourth wickets respectively. Pandey, who bowled with good pace and stuck to the right line and length, wrapped up the game as India recorded its tenth straight win in ODIs, stretching back to February 2016. The only other time India had won ten in a row was between February and April 2004. On that occasion, it had beaten West Indies and Sri Lanka five times each. This time, its streak included one win each against Australia, Ireland and South Africa, three against West Indies and four against Sri Lanka. India takes on Bangladesh in its next game at the Nondescripts Cricket Club, while South Africa plays Sri Lanka at the P Sara Oval. Both the games are on February 17.